Home » VectorVest » Buy Benchmark Holdings #BMK says VectorVest. There is every sign that the company is developing into a highly investible proposition. Buy Benchmark Holdings #BMK says VectorVest. There is every sign that the company is developing into a highly investible proposition. By Alan Green in VectorVest on 19th September 2018 . UK based Benchmark Holdings (BMK.L) challenges the status quo in aquaculture. Since 2000, BMK has consistently worked to build a technology-rich platform in the areas of genetics, advanced nutrition, animal health and knowledge services, to serve its customers, helping them to improve yield and efficiency in a sustainable way. The Company has leading positions in its core markets and established R&D, manufacturing and distribution capabilities to serve all the major aquaculture markets. BMK operates in 27 countries globally and employs 950 people. On June 19th2018, BMK published interim results for the six months ended 31 March 2018. The Company reported a 91% increase in adjusted EBITDA to £6.3m on revenues 9% higher at £75.7m. An £8.2m loss for the same period last year turned into a £3.6m profit, driven by improved trading, a reduction in finance costs and a £9.2m tax credit resulting from a reduced deferred tax liability on intangibles from the acquisition of INVE. CEO Malcolm Pye said the results showed “good organic revenue growth and improving profitability on an adjusted basis, while we continue to invest in our pipeline of new products and infrastructure.” “The outlook for the Group is positive as the drivers for our business are stronger than ever before, with continued growth in aquaculture and increasing recognition from consumers, producers and regulators of the need for sustainable solutions to enable future growth.”Separately on Sept 10th2018 BMK announced the commencement of production of salmon eggs at its new land based breeding facility in Salten, Norway. The centre is the World’s most advanced egg facility, and increases Benchmark’s capacity by 75%. Since the end of May 2018, BMK has consistently flagged a high Relative Value (RV) reading to VectorVest members. 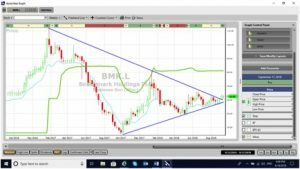 The RV metric is an indicator of long-term price appreciation potential, and even today continues to log BMK at 1.47, excellent on a scale of 0.0 – 2.0. Added to this the company logs a GRT (Earnings Growth Rate) of 32%, which also rates as excellent on the VectorVest stock and portfolio management system. Cautious investors may decide to look elsewhere given that BMK offers a ‘fair’ RS (Relative Safety) rating of 1.00, again on a scale of 0.00 to 2.00, but trading today at 62p, BMK still offers plenty of upside against a current VectorVest valuation of 81p. The chart of BMK.L is shown above using weekly candlesticks. The share is undervalued and has recently broken upwards from a five-wave symmetrical triangle of two years duration. The first technical target from the triangle breakout is around 100p.